Many people on the internet have a blog these days. Some are interesting to read, others are not. What bloggers above all want, is getting as much website traffic on their blog. This simply means getting as much readers as possible. There are many ways to get more readers. First, you'll need to create a RSS Feed for your blog. To keep track of your feed, submit it to Feedburner. Now get ready to blog and share. Depending on what you write, there are several options to get the world to know that you've created an awsome post. You can submit them to community sites such as StumbleUpon, Del.icio.us, Digg etc. If you're still not satisfied with the results, you can try a whole new way of sharing your posts: BlogRush. It'll boost up the traffic on your website and you'll probably get more readers out of it. It works like a charm! And best of all: It's completely free. Watch the video tutorial how to set up an BlogRush account and how to get it all working. It's as easy as that! You just add the widget to your website and BlogRush will do the rest. My widget can be found on the left bottom corner of my blog. 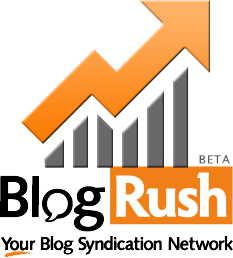 So, create a BlogRush account and get blogging!